Wow – it’s been two years this Memorial weekend that we welcomed Kali to our family with open arms on the Saturday evening of Memorial Day Weekend 2014 We picked up Kali from SFO and drove off into the night to Livemore where she has given us unconditional love and shaped our lives. And for the past three weeks she’s also having a positive and loving impact on the life of her little sister Kloe who joined the pack three weeks ago. Kali has been a wonderful big sister and we are thrilled to see a deep bond developing between Kali and Kloe. This Memorial Day weekend is a little busier than two years ago. 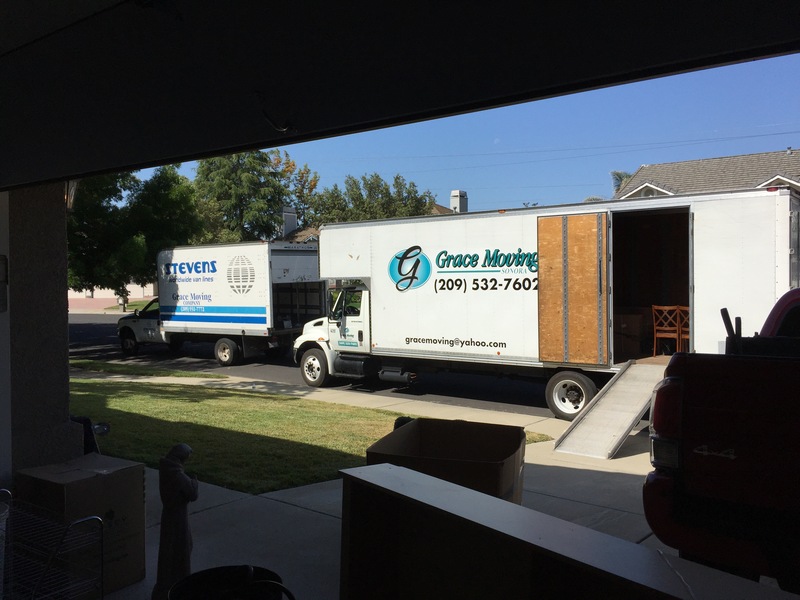 On Friday the moving company loaded 23 years of Livemore into trucks and took it to our new home in the Sierra Nevada Foothills that we call “The Golden K”. Although we’re quite busy getting unpacked and settled into our new home I had to take a moment to write this brief post to note this anniversary weekend and reflect on how much our Golden Kali has meant to our family. We especially want to thank the volunteers at True Love Dog Rescue here in California and in the volunteers in Taiwan who work tirelessly to save dogs like Kali and bring them to loving homes in the U.S.
Golden Kali, puppy Kloe, Holly, and I are finally in our way to the hills. Kali and I hope to post more frequently once were settled. Our next post will be from the Golden K in Tuolumne, CA. 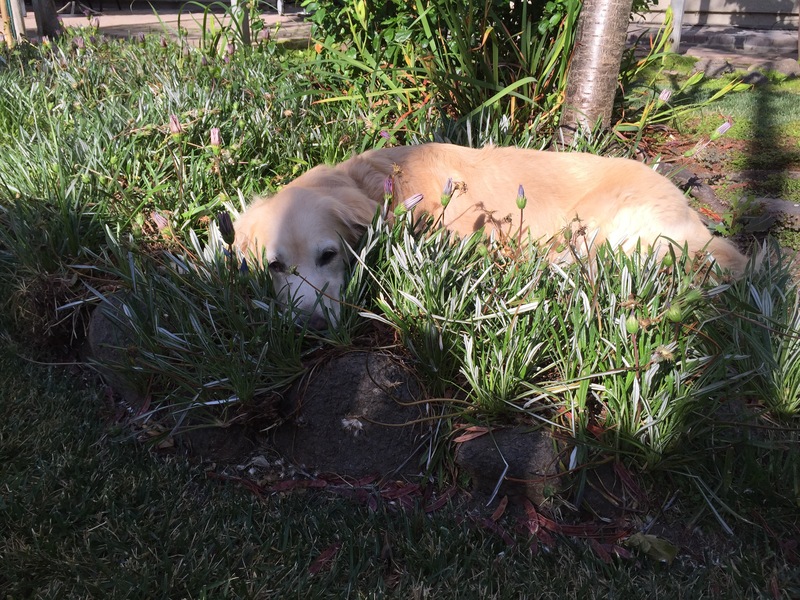 Hanging out in the yard one last time while the movers pack up 23 years of Livermore. We brought Kloe home two weeks ago and we couldn’t be more thrilled to have her as part of our pack. I was fairly certain that Kali would welcome her and be a good big sister or maybe even a surrogate mama. My Golden Kali has exceeded my expectations and has not only accepted embraced Kloe but has assumed responsibility for helping with Kloe’s training. 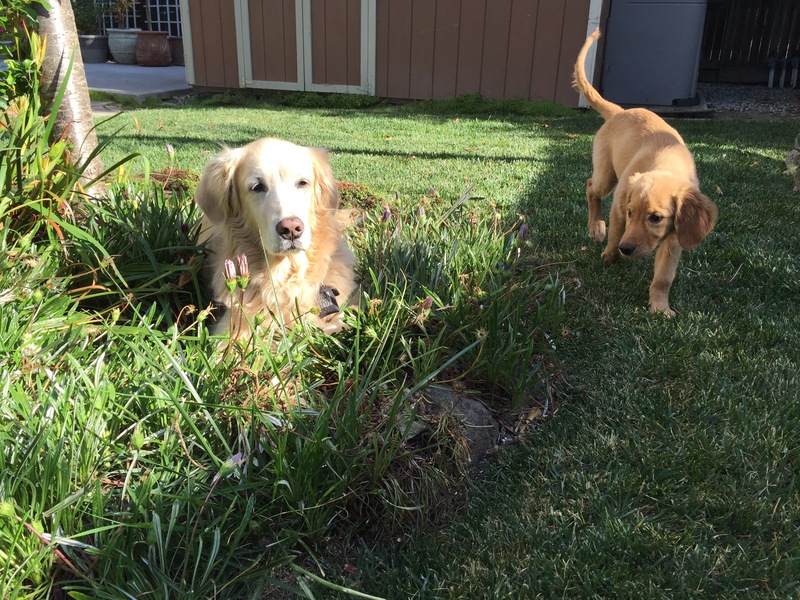 Kali is doing all the natural things you would expect from an older dog to help socialize the pup to the pack. She allows Kloe to chew on her face and use her body as a personal jumpy but only within reason. When Kali has had enough she let’s Kloe know through body language, a mild growl, and by throwing her 57 pounds of body weight on Kloe’s 18. When Kali naps she welcomes Kloe to spoon with her or lay on her belly. During tug of war Kali allows Kloe to hold her own until the very end when Kali shakes her loose. But this morning I saw something that surprised me and made me realize that Kali is truly helping with training our newest Golden K.
It was around 6:30 am (yes 6:30 we have a puppy!!) and Holly and I were sitting on the floor in the family room drinking coffee, watching the dogs play tug 0f war after breakfast (theirs not ours). They did their tug of war dance for about 15 minutes and then we observed something rather remarkable. Kali was teaching Kloe “leave it”. A basic of training is to ask your pup for the toy they have in their mouth, by saying, in our case, “leave it”, and then rewarding them for letting go and then immediately giving them the toy back. It builds an important bond of trust between you and your pup. As we were watching the dance we watch Kali shake the toy strongly enough to shake Kloe’s grip loose. Kali is standing there with the toy in her mouth as Kloe stares. Kali drops the toy on the ground no more than a foot from Kloe’s gaze with her head slightly tilted in Kloe’s direction. Kali gives a soft but firm growl while looking at Kloe. Kloe respects the growl, lies down, and doesn’t try to get the toy. Kali picks up the toy and takes it Kloe and they begin tug of war again. After another 20 or 30 seconds Kali shakes the toy loose and again drops it in front of Kloe. She stares at Kloe. Kloe stares at the toy but remains put. Kali picks up the toy and takes it back to Kloe. Kloe accepts the toy and they resume the play. I turn to Holly and say, “I think Kali is teaching her leave it”. Holly concludes that Kali is not impressed with the training we have provided so far and is taking matters into her own paws. I’m ok with it. As all of you know who have raised a puppy you need all the help you can get with a quickly emerging a teen-ager in both size and attitude. And for me I would want no other canine trainer helping us other than my Golden Kali. In the left corner hailing from Bakersfield, passing through Lodi, briefly spending time in Livermore and then onto the Sierra Nevada Foothills is Kloe! 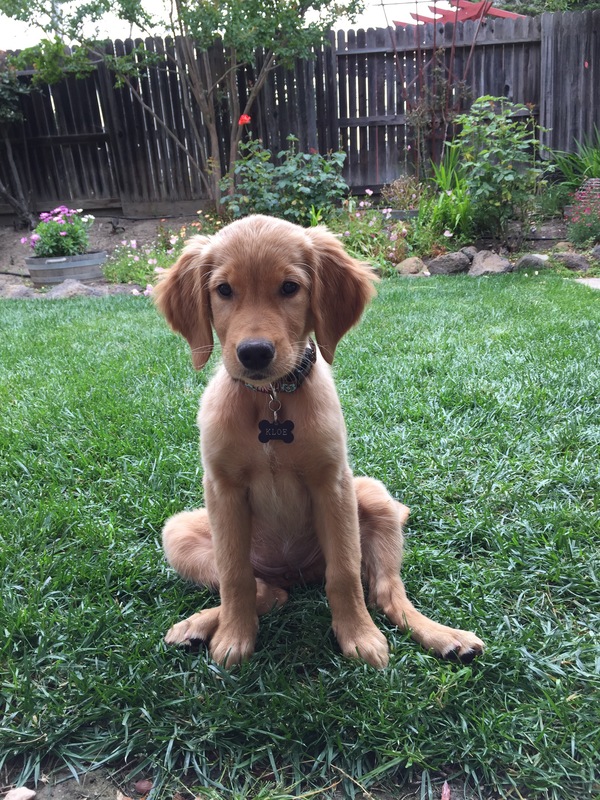 At nine weeks old, in light red fur weighing in at 15 pounds is the Golden Retriever puppy ready to win your heart and dazzle your imagination. Actually, like Kali, I’m sure Kloe is a lover and not a fighter. After all she’s a Golden. Another “Golden K”. Kloe joined our pack this week and we are thrilled to have another fur baby in the den. Like most babies she has already established a routine of play, eat, poop, sleep, and repeat. Holly has been great taking the lead and doing all the right things to quickly establish ground rules, routine, and discipline. She’s an experienced mom so I’m not surprised at the combined success! Kloe has been trying her best to get her new big sister to engage in play but Kali so far has been uninterested. I think Kali will come around but for the moment she is a reluctant participant. Meanwhile, we are thrilled that another “Golden K” has joined the pack and will be with us on this adventure called life. As mentioned a few posts ago the tag line of this Golden Kali blog has changed to “Kali’s New Life In The Mountains“. It used to be “Kali’s New Life In America” but it’s been almost two years since she arrived and we are now off to new adventures in the Sierra Foothills. Kali will have a new companion beginning next week. Her name is Kloe and she is an eight week old Golden Retriever. So while this post provides a sneak peek to the new pup who joins our pack next week, it’s mostly about why Holly and I feel compelled to bring more craziness love into our lives. Especially during a time of significant transition. So when I told her about Kloe she didn’t offer congratulations but she did offer many cautions and some of the aformentioned motherly advice. Vicki says, “Michael, puppies are a lot of work. Do you really know what you’re getting into? That puppy is going to pee all over your new house”. I was a little hurt but not surprised. I love my sister and as we’ve aged I’ve come to see her as the beautiful loving person she is. She married late, never had children, and has always been a loving aunt to my kids. She is also a sincere animal lover donating time and money to various animal causes. Maybe in this case just not a lover of animals who may make her brother’s life hectic and dirty his house… 🙂 She is compelled after almost 60 years to take care of me and I love her for that. Vicki – Thanks for your email. No apology necessary. Crazy how life works sometimes…. Why do many people have kids? They’re a lot of work, heartache at times, and cost a lot of money. They break things, make messes, and demand your attention when you’re too tired to even think let alone play a game or throw a ball. Yet we have them, mostly on purpose, and once our children are born we have no regrets. Why? Because kids are unconditional love, they’re innocent (at least for a while), they’re fun, they keep us young at heart, they make us feel secure and make us feel complete. Children complete the family unit and sometimes the more the better. I think for me this is why, especially now that the kids are grown, we have dogs. All the same rationale above about children apply. I’ve never thought about having a dog in these terms before. At least not consciously. But this morning at 7:00 am as I read my sister’s message on my iPhone with Kali lying by my side it was perfectly clear and I felt compelled to reply. Although Vicki had no children family has always been paramount to her and she will understand and agree with my rationale and emotions. She may not even care if Kloe has an “accident” when I bring her over to visit. Kloe and her sisters. I wish we could bring home the Trio!